Thanksgiving is coming up and I searched online for my favorite digital learning tool: Online cooking games. Arm yourself with a good vocabulary list and you got yourself the best interactive learning experience ever. Add a smartboard, a smartphone, or a touchscreen such as an iPod or iPad and you will make the learning entirely yours. Next, look for all the optional changes you can make to the original scene. I counted more than 10 words. 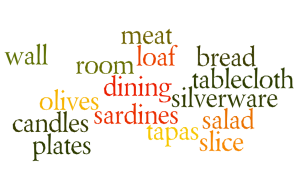 Using Wordle, I created a vocabulary list to introduce prior to asking the student to change things.